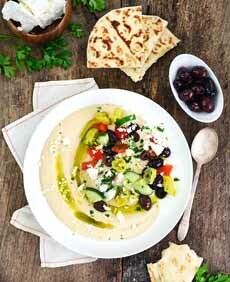  For lunch, top hummus with a Greek salad (photo courtesy DeLallo Foods). Another way to plate. You can create variety with chopping techniques: dicing, julienning, shaving, spiralizing, etc. (photo courtesy DeLallo Foods). A “rainbow salad” topped with flavored hummus (photo courtesy Bush’s Beans). Most Americans enjoy hummus as a dip. That’s how we served it last night for Oscar fare, with crudités and pita chips. 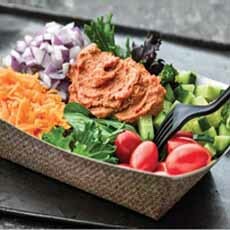 But we also like hummus as a luncheon dish, with a variety of salad toppings. You can also set it up as a DIY buffet. 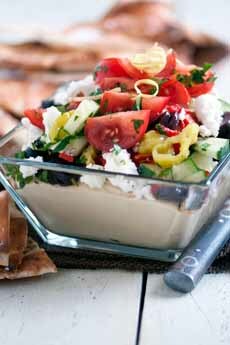 Today’s tip: Add hummus to Greek salad ingredients. Here’s what you need for your dish. Serve with a side of pita, or turn pita chips into croutons for the salad. *For more flavor, mixed chopped dill and/or scallions or chives into the yogurt. If you have it, add a bit of lemon zest.